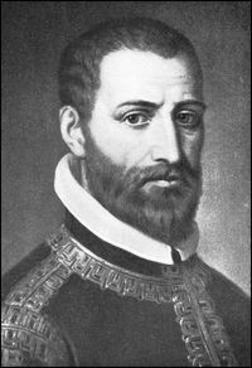 A cracking piece of music – Margot, Labourez les Vignes (1554). By Jacques Arcadelt (1507-1568), a prolific Franco-Flemish composer whose work was published throughout Europe. In his youth Arcadelt was sent to Italy, where he wrote plenty of devotional music, but he also spent time on the secular side, bringing the madrigal form to its early maturity. On his return to France he concentrated on chansons. The Tudor connection? Nothing direct, but Arcadelt did have an influence on Elizabethan composers. But I’m not that country-bred. Should it die, I’ve lost my time. The male parts sound particularly good with those acoustics, and I enjoy the soprano’s patter – vigne vigne vignolet – like a ricochet effect on strings. Other versions of Margot may be faster, but none so playful … or as easy on the eye. Also the difference between the female singers – what’s with the skull on the t-shirt? I likes it. BBC Radio 3 has a short discussion on the song with Howard Goodall (Windows media player, 2:59) – compared to the old solemnity and stiffness, Arcadelt’s style was, “shockingly different in its attitude”. The chiefs were Dowland and Monteverdi. A delicate revolution. ps. Goodall refers to the lyric, “to whom I was the pox” – I can’t source that. Goodall’s ‘to whom I was the pox’ translates the phrase “Je suis leurs fièvres quartaines”, which occurs in the text of the 1567 edition. You can find more information than you probably want on this phrase on . Frankly, even with all the information given there, I still don’t get it. I have a hunch that Goodall is right to think of ‘the pox’ rather than ‘malaria’, but who gave the pox to whom is a question I’d rather not answer. That the text “turns to the implied obscene” (as the 1980 Grove puts it) suggests to me that the author of the Grove article on Arcadelt thinks along the same lines. Why the URL of the website I enclosed between pointed brackets does not appear in my reply on your website I don’t know. I repeat it here without : https://lorexplor.istex.fr/wicri-lor.fr/index.php/Margot_labourez_les_vignes and hope it will show up now.